Beautify your home and garden while supporting Hospice Care Ottawa! The next time you're considering purchasing something to improve your home or garden, consider doing it at Rona. The more you shop at Rona the more you support Hospice Care Ottawa! 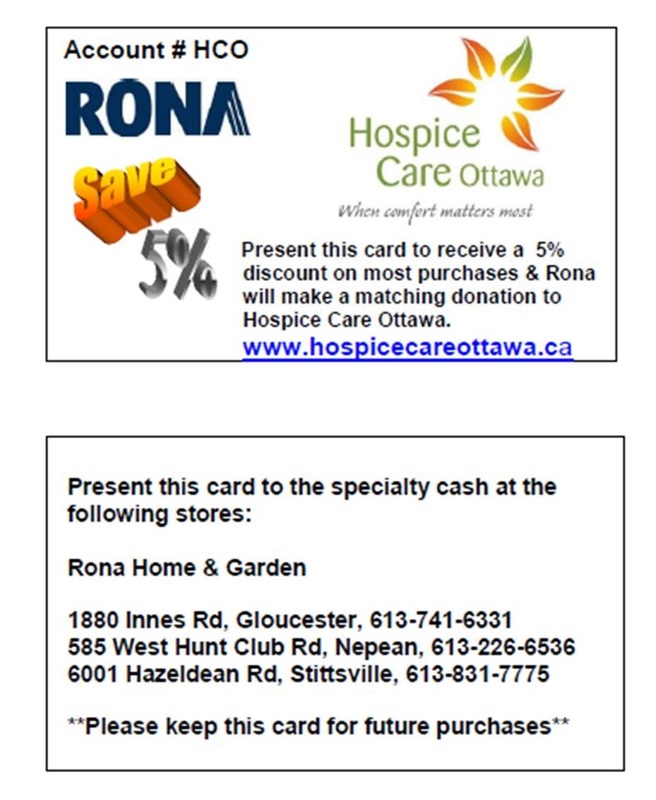 When you shop at Rona with a Membership Card you will receive an immediate 5% discount (on most of the 45,000 items sold) and Rona will donate five per cent of every purchase to Hospice Care Ottawa. This is paid out annual to Hospice Care Ottawa in a cheque or gift cards. Simply obtain a Rona Membership Card (below) and present it along with your purchase at the Rona stores located at 585 West Hunt Club Rd., 1880 Innes Rd, or at 6001 Hazeldean Rd. Get your Membership Card to start saving today! Click here to print your own membership card. and/or Air Miles promotions however regular Air Miles does apply. This is applicable for in-stock merchandise only and not for special order. Rona will donate 5% of every purchase made with the discount/ donation card even if the item you purchase is not discountable.